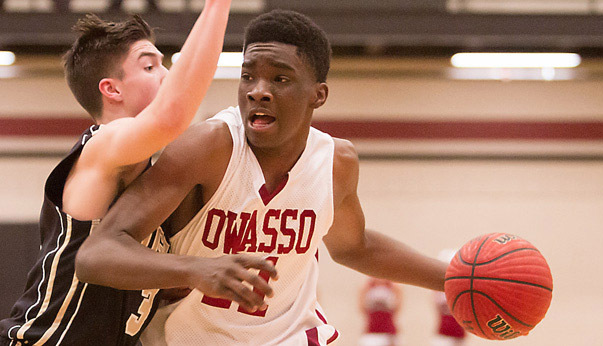 Heading into last weekend’s official visit to Indiana, 2015 Owasso (Okla.) guard Shake Milton said he knew Indiana fans were passionate about Hoosiers basketball. But he had yet to see the full extent of it in person, having taken an unofficial visit to Bloomington during the summer in June. But for Milton, perhaps the most valuable part of his official visit came on Sunday, during a “pretty personal” conversation with Crean. After all, when making his eventual college decision between the Hoosiers, SMU and Oklahoma, Milton said it will likely come down to where “I’m most comfortable and where I can trust the coach to help me reach my goals.” That decision will likely come within two weeks, he said. Indiana has pitched the idea to Milton of being a combo guard within the Hoosiers’ system, one that would assist in their efforts to get up and down the court quickly. Milton also is close with the Hoosiers’ only commit in the 2015 class, Juwan Morgan, as AAU teammates on MoKan Elite. The two have even talked about potentially playing together in college, as Milton said “it’s definitely a bonus” in his chances toward choosing the Hoosiers. However, Milton noted, “at the end of the day what’s best for Juwan might not be best for me.” And while he has come away impressed by Indiana, he admitted he has a difficult decision ahead. Good luck deciding, Shake. Now “shake” off the doubts and put on the stripes! I hope we land this kid. However..one member of the Forum last week speculated that personal family issues may give OU a leg up in Milton’s recruitment. Apparently his father passed away recently….leaving his wife, Shake and two younger siblings.. Deciding to stay closer to home in that circumstance is understandable. Just have to keep our fingers crossed. Saw this kid play in t he Peach jam and he’s got the full offensive game. Oh man, breaks my heart. I really wish him and his family well. I know CTC and Hoosier Nation would take him in as our own son. Coming from an OU fan… This one is too close to call.. I think OU leads because of location but I know OU coaches are worried about IU and then “experts” starting picking SMU right and left a couple days ago. I think OU wins out, SMU coach cant last forever and never stays anywhere very long, Crean hasnt done much and is on the Hot seat by many people. His Dad died several years ago. I think distance from home keeps him from IU. But I could be wrong. Shake will make the best decision for himself and his family, but Tom Crean is not on the Hot seat. Take it from a Hoosier fan, and don’t listen to twitter noise. Tom Crean has assembled a GREAT team for 2014, and our hopes are high for 2015 as well. Shake only had to attend one football game to realize that Indiana is a “basketball school.” Our biggest advantage over OU. Ouch. Sad, but true. Take me down to Shakytown! I think if he chooses Oklahoma it will be because of proximity to his home but if he really wants to develop into an elite guard with a chance to be a lottery pick, he should choose Indiana or SMU. Crean has recent success with developing guards (Oladipo) and there is no question that Larry Brown is one of the greats and can prep guys for the NBA. I disagree. Lon Kruger has won a lot more games than cream. Doesn’t make sense to go to smu. Brown is gone anyday. Cream has done what?? One good year? Bball school? Sure but that’s old trandition. Overrated recently. Sampson was a good one, just someone kept turning him in… Every coach called kids! I won’t argue whether Crean is a great coach or not but he can definitely identify and develop talent. You could be right about Larry Brown but he is a legend and kids would love to play for a living legend. I can tell you this with 100% certainty: All kids want to win (even if they only stay 1 year) but they are more interested in who can get them to the NBA the quickest or make them the best player. So, while you may still be right in saying that Oklahoma is the front runner, it won’t be because of Lon Kruger’s win/loss record. First, his name is Tom Crean…not Cream. Second, of course Lon Kruger has won a lot more games…he’s been coaching since the early 80’s. He’s a good coach but let’s not pretend like either Kruger or Crean are elite. They both have one Final Four appearance (Crean’s with Marquette who hasn’t been back since, Kruger’s with Florida who has risen to a higher level since he left) and they both have had one very successful season in the B1G (although Crean’s B1G title was outright and Kruger’s was shared and with a 23-10 team that was bounced in the Second Round). Kruger has a win % of 61% and Crean’s is 60.1% (which includes a really rough two-year stretch that he had no control over and very little chance of winning games). Crean can point to some very high draft picks in the last couple of years, Kruger cannot. I think they are pretty comparable coaches with similar resumes and there’s no need to come onto an IU fan site and denigrate the Hoosiers coach in order to prop OU’s up. Tom Crean and Lon Kruger are both perfectly fine coaches that no one would put in the Top 5 nationally and Shake Milton will feel more comfortable with one guy over the other or one place over the other and I’ll wish him the best of luck either way. Well, I guess it’s a good thing we aren’t recruiting Coach Talk. Unfortunately, Coach Talk, current actual recruits (including Milton, and Morgan, and Blackmon, and Johnson, and … ), view Indiana as a real basketball school regardless of “old trandition” and whatever your personal thoughts are on the matter. I’m not saying this means Milton ends up in Bloomington. He’ll make whatever is the best decision for him and his family, especially considering the circumstances. That’s all you hope for the kid. What I AM saying is you can question some things about Indiana, but to ever imply Indiana isn’t one of the premier and most recognizable “basketball schools” in the country (regardless of recent history) shows you don’t really have a grasp on what “real basketball school” means. Kids care about getting to the next level. Crean has turned out more NBA talent than Kruger in recent years. Advantage IU. Kid is from Oklahoma. Advantage OU. He’ll have an easier and more comfortable college life if he stays at OU, but that’s just a few years. Judging by talent developed, he has a better chance at a better career if he goes to IU. I certainly can’t blame him for choosing family over career. Crean is perceived to be on the hot seat because IU is such a basketball-centric school. We expect excellence here from coaches and players. I can’t speak for the basketball climate in OU because I have no experience with it, but a lot of schools readily accept mediocrity in their program. There’s pressure at IU for both coaches and players to excel, and the players who respond well to that pressure have a better chance of becoming stars. Maybe..but most other people don’t recruit thugs and they at least make the appearance of caring whether or not players attend class. Crean inherited 18 F’s.. when he took over the program. Not sayin Sampson didn’t know his X’s and O’s..but he didn’t have a cue or care about a “C” vs. an F. Give him 3 years at Houston and you’ll see a functioning b-ball team with questionable kids and who knows what going on the background. Hard to take a “sleaze” pill…and get well when you are making half a mil in the pros. Agree (SCHoosier). Also, I don’t get this notion that Sampson is/was such a tremendous coach. How many finals fours has he been to? Didn’t he get beat by us with the great Mike Davis? If he’s not making the decision this week, our chance is slimmer than we’d think. Would love to get this kid, but he won’t have as much immediate play time as Juwan. Its a basketball school because the state has a long, deep rooted basketball culture and most of the students, male or female, start playing at a very young age. Its the student body as much as the men’s basketball program that make it a basketball school. If you’re trying to be insulting its working. Those “18 F’s” are still a little overblown to me. If even two of the kids left the team and never bothered to officially un-enroll that’s potentially “10 F’s”– which is misleading. I’m more curious to know what the grades were the previous year or even the fall semester. I assume we would have had to meet with NCAA compliance. I’m still not sure where all the “thug talk” comes from. I know he preached a hard nosed game (and there were whispers of the dreaded ‘marijuana addicts’ running around campus), but I’ve never seen any actual evidence of goon-like behavior from our team. I’m not saying it’s not true or that Sampson was the world’s greatest coach, but I’m not convinced he’s the antichrist either. That was the best argument against Sampson all along. The Hot Seat stuff is from fans who are mad about the team getting eliminated early (sweet 16) and then stinking last year. Those fans forget / ignore that even great coaches get bounced early from the NCAA early sometimes (i.e. : Duke/Syracuse) and have poor years (RMK – had some rough years in the 1980s). Now, if this year is like last year (which I don’t think it will be), then it will be Brady Hoke Hot by seasons end. And IU fans want soooooooooo badly to be able to root for the football team. It’s a shame they couldn’t win the Bowling Green & Maryland games. They would be the talk of the town if they had. I think he was being sarcastic referring to someone on a previous post downplaying it. I could be wrong but I get the impression he’s in agreement with you. Correct me someone if I’m wrong, but didn’t Eli Holman throw a potted plant have have to be escorted out of the basketball offices? The kid is quick and not afraid of contact going to the hole. Because of his height, he won’t be as coveted by NBA scouts. He could turn out to be a great player long term for IU and be one of the few remembered by their first names, like Isaiah. Kruger is 14 years older than Crean, and both started (head) coaching in their early 30s. If you divide those 246 additional wins by the 13 additional years that Kruger has been a NCAA head coach, that is about 19 wins per year, which is certainly not out of the question for Crean to overcome over the next 13 years of his career. Also, define good year, because if the hurdle is a conference championship and Sweet Sixteen run, Kruger has had one good year in his entire career. I believe you are correct– of course it was right after his coach got fired, his season imploded, and he was just told he was kicked off the team. I probably would’ve done worse. Anyway, if it was the last thing one player ever did on campus, I don’t think you can say it created the “thug” image for the whole team that season. Everyone knows it was a stupid bureaucratic rule, which is probably why it’s no longer against the rules. However, rules are the very foundation of sports and if you willingly break one, whether in’s on the floor or in the office, I’m gonna have to whistle you for the intentional. Everyone knows it was a stupid bureaucratic rule, which is probably why it’s no longer against the rules. However, rules are the very foundation of sports and if you willingly break one, whether in’s on the floor or in the office, I’m gonna have to whistle you for the intentional. I don’t despise Sampson. I pity him for not learning from his many mistakes and chances he’s been given. This OU team would wear out this IU team. Sounds like Norte Dame Football. He wasnt one to recruit thugs. I dont know enough about his stint at IU but Kids graduated for him at OU. Not many run ins with the law etc. All he did at OU was win. Whoa whoa whoa there. Brady Hoke Hot? IU would have to win about 5 games this year for that to happen. Hoke will be lucky to make it to season’s end. Michigan football wishes they had IU’s football resume this year even after the Maryland debacle. there are always exceptions to the rule.